Ethiopia once again faces an uncertain future in the wake of Prime Minister Hailemariam Desalegn’s resignation and the declaration of a state of emergency. Until Al-Ahram Weekly went to print on Tuesday, the Ethiopian People’s Revolutionary Democratic Front (EPRDF), the country’s ruling coalition, has yet to designate a successor. In this latest chapter in the political turmoil that has gripped Ethiopia for the past quarter of a century, the government was unable to calm the unrest that had erupted, especially among the country’s largest ethnic groupings, the Oromo and the Amhara. The release of a couple of thousand political prisoners failed to alleviate tensions. According to human rights reports, about a thousand people have been killed in the latest eruption of violence, the largest toll since the fall of the communist government in the early 1990s. In the aftermath of a previous wave of unrest, the Desalegn government declared a state of emergency from October 2016 to August 2017. A communication released by the ruling EPRDF described the state of emergency declared after the prime minister’s resignation as “vital to safeguarding the rule of law and the constitution in the country”. In spite of the sudden resignation, some Egyptian and Ethiopian observers suggest that it was a natural step in view of Desalegn’s affiliation with a religious and ethnic minority. According to the Ethiopian journalist and writer Malalu Joli, Desalegn was unable to unify the parties that formed the ruling coalition since 1991. Hani Raslan, a researcher at Al-Ahram Centre for Political and Strategic Studies, argues that the fact that Desalegn was a Protestant (the majority of Ethiopians are Eastern Orthodox Copts) and from one of the smaller ethnic groups in the south prevented him from becoming an “effective prime minister”. As a result, he remained a “transitional” ruler. 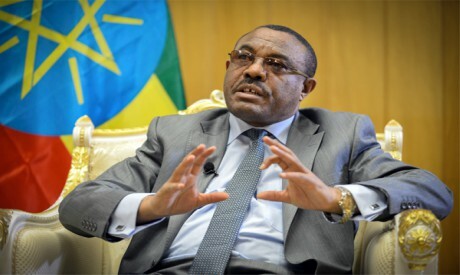 Desalegn came to power in 2012 following the death of the powerful Meles Zenawi who rose to power in 1991 following the overthrow of the regime of Mengistu Hailemariam and the Derg Committee (which had ruled from 1974 to 1991). Zenawi belonged to the Tigray, who make up about six per cent of the populace and who control the EPRDF. Raslan adds that Tigrayans also control the key institutions of the state, which is one of the reasons for discontent among the Oromo (over 34 per cent of the population) and the Amhara (about 27 per cent of the population and the ethnic group that had ruled Ethiopia for most of its modern history). The unrest began when the government announced plans to expand the capital, which entailed what was termed sequestering land for the public weal. The land belonged to Oromo farmers who live in the country’s largest state, which includes the capital, Addis Ababa. The government was shaken by the uprising of the Oromo who complain of being marginalised by the Tigrayan-dominated government. According to Amnesty International, the Ethiopian government arrested thousands of Oromo in the five-year period from 2011 to 2015. According to the Jada organisation, which focuses on the conditions of the Oromo, the number of those arrested is as high as 20,000. The government denies both figures, even though it released 6,000 detainees in January. Tensions between the national groups mounted during the 2015 elections, in which EPRDF gained control of 500 of the parliament’s 547 seats. However, the main turning point, according to Alan Lofis, author of The African Decentralisation Game, came with the controversial 2005 elections in which the opposition won a third of the seats and claimed that the government had tampered with the results. Since then, the government became more authoritarian. While the EPRDF consists of four major parties, representing the Oromo, the Amhara, the Somalis and the Tigray, the first three claim that the parties that speak in their name do not really represent them and that their participation in the Tigrayan-dominated coalition is purely nominal. “This token participation could not continue because it did not mirror the reality in the country,” said Ethiopian writer Dawawit Hailemariam. For example, he said, the government refused to recognise the 2016 famine that affected 4.5 million people for what it was. It called it a “food security deficit” because it did not want to draw the attention of the international press. On the other hand, Desalegn and Zenawi before him made Ethiopia the fastest growing country in Africa. The Ethiopian economic growth rate averaged 10.8 per cent, compared to the 4.8 per cent average in the rest of the continent. Within the space of a decade (2003-2013), agriculture (which contributes about 40 per cent of the GDP) grew by 5.4 per cent, manufacturing by 21 per cent and services by 12 per cent. The Desalegn government sustained the rate of development, which never fell below nine per cent during his six years in power. Also to Desalegn’s credit is the fact that growth was not centralised, or confined to a particular region. Rather, it was countrywide. Still, the Oromo were not the only ones to complain. The Somalis in the south, in Ogaden, have long been demanding independence since the time of Emperor Haile Selassie. But the Oromos and Somalis are not united against the government. Rather, they are rivals, sometimes to the point of hostilities. At the beginning of the year, clashes erupted between the two ethnic groups in relation to a conflict over pasturelands. The Ethiopian ethnic communities lack confidence, which decreases the likelihood of a government collapse. But this does not negate the delicacy of the situation in a country with multiple ethnicities, cultures, languages and religions, and a history of military coups, famines and civil strife. The Somali region is particularly sensitive for the government. Somalia has laid claim to Ogaden for decades and, in the 1980s, a war broke out over the region in which the US supported Somalia and the Soviet Union supported Ethiopia. That war concluded with a peace agreement signed in 1987. Some government circles remain wary of the political and tribal connections between the Somali region and Somalia. The Oromo accuse the Somalis of recruiting youth from tribes in Somalia to fight in their militias. The Somali regional government denies this. The Oromo, according to Dawawit Hailemariam, also feel that they stand alone. The smaller ethnicities fear the Oromo’s numerical superiority while the Amhara could ally with the Tigray as a means to avert a Tigray-dominated ethnic dictatorship. Although it is unclear who will replace Desalegn, many observers believe that the Tigray will not succeed in pushing their candidate through the EPRDF, but that they will simultaneously resist other candidates for fear of losing their longstanding grip on power, a fear augmented by the memory of having been excluded from power throughout the imperial and communist eras. On the other hand, the government certainly does not want the post to remain vacant for long, not least because of foreign relations concerns. This area will probably be no less of a challenge for the forthcoming prime minister than domestic troubles. Ethiopia is in the middle of difficult negotiations with Khartoum and Cairo over the Nile Basin and the downriver impact of the Grand Ethiopian Renaissance Dam (GERD). The Egyptian media has charged that Addis Ababa is being intransigent, especially on the question of the schedule for filling the GERD reservoir. Egypt wants the period to extend from seven to 10 years, while Ethiopia insists on three. Egypt fears that the filling of the reservoir, which will have a 74 billion m3 capacity, will diminish its share of Nile waters (55.5 billion m3) and hamper its agricultural development, water treatment and irrigation plans. In Raslan’s opinion, Ethiopia’s “difficult” situation at present may smooth out the negotiating process between Cairo and Addis Ababa. For the moment, however, Ethiopia wants to postpone the new round of negotiations and has asked Cairo for its “understanding”. Ethiopia’s fraught relations with its Eritrean neighbour will also cast their shadow over the new prime minister. Asmara has emerged from its isolation through its rapprochement with Egypt and some Gulf countries. It has sided with Saudi Arabia and the Arab coalition in the war in Yemen and with the Arab quartet that declared an embargo against Qatar. Asmara benefited economically from these developments, through investments in Eritrea (the UAE port development project at Asab) and developing economic relations with Egypt and Saudi Arabia. These factors will strengthen Asmara’s hand vis-à-vis its Ethiopian neighbour with its larger land area, larger population, greater resource and faster economic development. To the south, Addis Ababa continues to contend with the Somalian question. In addition to the aforementioned problems, Somalia has been unstable since the fall of Siad Berri in 1991. Meanwhile, Somaliland, not recognised internationally, has enlisted with the Saudi-led Arab Coalition alongside Eritrea. Even Sudan, which some observers regarded as an ally to Ethiopia in the GERD negotiations, may drift away, especially in light of the recent rapprochement with Egypt. Perhaps more alarming to the government in Addis Ababa is the spectre of investors being scared off by a continued vacancy at the top and the prospect of instability. The consequent reductions in influxes of money and revenues would severely slow Ethiopian growth and encumber the government’s efforts to remedy the complex socioeconomic problems in the country. Ethiopia certainly is facing a difficult test. In order to succeed, it needs to safeguard its federal system, sustain economic growth and preserve its foreign relations.